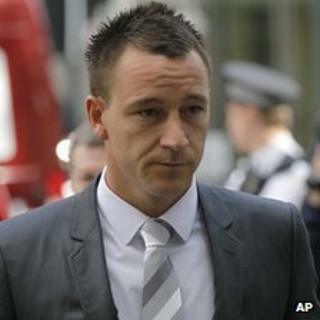 Chelsea defender John Terry was using "straightforward racial abuse" and not repeating what QPR's Anton Ferdinand had said, a court has heard. Prosecutor Duncan Penny said Mr Terry had been "lashing out verbally". The ex-England captain had told Westminster Magistrates' Court he was repeating what he thought Mr Ferdinand had said to him. Mr Terry, 31, denies a racially-aggravated public order offence over the alleged incident last October. The pair exchanged insults during a Premier League match at Loftus Road. Earlier, the court heard Mr Terry had "lost it" and was annoyed as his team struggled in the match and he reacted to taunts about his alleged affair with a team-mate's ex-partner. In his closing speech, prosecutor Duncan Penny questioned Mr Terry's claim that he was simply repeating Mr Ferdinand's words. He said: "If it's rhetorical repetition, why does the word 'and' feature at all? Why are any other words spoken by Mr Terry at all." "Are they simply a plain response, a retort, lashing out verbally just as Mr Terry did in the original exchange? "Just as he did with the hand over the mouth to imply bad breath... and finally, when he was fed up, he picked up on the topic of Mr Ferdinand's abuse, namely the (alleged) extra-marital affair, and retorted with 'and yours', or something to that effect, and straightforward racial abuse," Mr Penny said. He added it was unlikely that Mr Ferdinand would make a false allegation of racism. The QPR player was not the first "victim" who did not want to testify in court, he added. Mr Penny said: "This case will follow him for the rest of his career. "You may wish to ask yourself the question, whether in truth he was brave to give evidence in this trial?" In his closing speech, defence lawyer George Carter-Stephenson QC said the prosecution case was based on "speculation". He said: "This is not a case about racism. The prosecution in cross-examination conceded that he is not a racist. "The way that this case is put is that, on this occasion, Mr Terry completely lost his cool and made an inappropriate remark making reference to a physical characteristic of Mr Ferdinand, namely his colour, in response to words conceded to have been repeated taunts and insults referring to his alleged affair with Mr (Wayne) Bridges' partner." The lawyer said Mr Ferdinand's account was "inconsistent and unreliable". He added: "No matter what the words actually were, if they were or may have been Mr Terry repeating back what he believed Mr Ferdinand had accused him of, then that's the end of this particular case." Mr Carter-Stephenson added it was "inconceivable" the taunt from Mr Ferdinand about the alleged affair would make him "snap" because the Chelsea player had heard similar taunts "hundreds of times before". He suggested it was Mr Ferdinand who "lost control". "Who is it that follows another player to the half way line shouting and abusing him and repeating an insult, which on his own evidence he says he did, over and over again? "That may be a good indication of who has lost it." Mr Carter-Stephenson said the Chelsea player was a "truthful witness" and added: "Mr Terry is a man with very considerable mental strength, and great self-control. "You might like to contrast that to what Mr Ferdinand himself has told you he did on that particular day." The case was adjourned until Friday when Chief Magistrate Howard Riddle is expected to deliver his verdict.